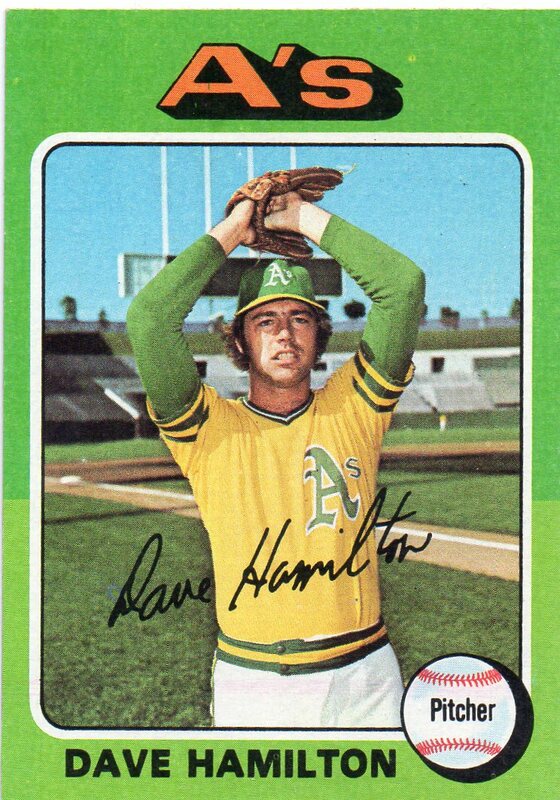 Notes From His 1975 Season: Dave Hamilton split his 1975 baseball season between the Oakland Athletics and Chicago White Sox. In 41 total games, Hamilton went 7-7 with 6 saves. He worked a total of 105 innings in 1975, allowing 105 hits and 42 runs en route to an ERA of 3.25. Notes From Career: Dave Hamilton pitched for four different major league clubs during his 9-year career. He has a lifetime record of 39-41 with 31 saves. In 704 innings of work, Hamilton struck out 434 batters while allowing 692 hits and 339 runs. Hamilton is a member of the 1972 World Series Champion Oakland Athletics. This entry was posted in 1975 Topps Baseball Card Set and tagged 1972 world series, 1975 topps, 1975 topps set, baseball, baseball cards, chicago white sox, oakland A's, Oakland Athletics, set builder, topps, topps baseball cards, white sox. Bookmark the permalink.